The Toronto condo boom has officially hit the Church Street Corridor. 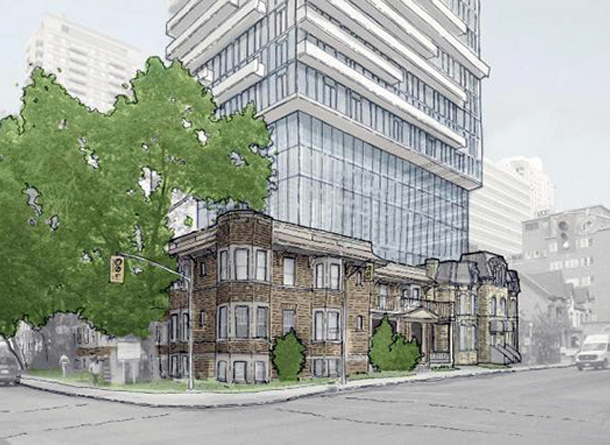 I’ve touched on the condo development happening along Church Street in the past, but some new drawings make it worth revisiting – check out what could replace the building housing Zipperz and the parking lot behind it! One big change has already happened – the park that used to be at Church and Isabella has been replaced by a 23 storey mixed use residential building that broke ground three years ago. You may wonder – why all the development now when there have been surface parking lots on the street for years? Turns out that there was a prohibition on tall buildings in the Church Wellesley village. The prohibition was challenged by Menkes who wanted to build a 100 metre tall building at Church and McGill. That proposal was passed in the fall of 2012 by the Ontario Municipal Board and since then, a slew of proposals have come forward. This is not necessarily a bad thing. South of Alexander, you pass a school and schoolyard on one side and an apartment building on the other. A little further south is Maple Leaf Gardens, and south of Carlton, it’s even quieter save for the occasional business. I think these buildings are going to bring more life on Church Street. You may say it’s not going to be the same as it was 25 years ago, but then, what is? These units would make great investment properties due to their proximity to Ryerson!